Earlier this week we hosted our eleventh Blue Prism Café with James Sheehy, director of business transformation and projects at Gilead and Anand Sekhar, managing director at KPMG. With over 10,000 employees worldwide, Gilead is an American bio-pharmaceutical company that’s rapidly transforming its business with intelligent automation. James is driving continuous process improvement through Gilead’s ‘Elevate’ process improvement framework and Robotic Process Automation (RPA). Anand is responsible for leading KPMG’s Technology Enablement practice for robotic and cognitive automation. James is on a fascinating journey that started with a vision of RPA and led to a ‘proof of value,’ which was achieved in only several months using digital workers. In fact, Gilead has not just saved thousands of human working hours – but has gained back extra capacity for the business too. During this time, the company also set a solid foundation for the successful scaling of their intelligent automation operations by leveraging Blue Prism’s enterprise-level, Robotic Operating Model (ROM). 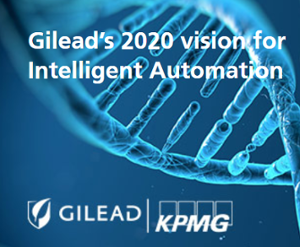 The first step in managing Gilead’s demand pipeline was to complete an assessment for automation opportunities that involved working with KPMG to identify, evaluate, score and prioritize RPA candidate processes. This assessment was made by business process owners using quantative and qualitative criteria based on their process knowledge and underlying data. A business case was then built for each candidate, estimating how improved accuracy, or increased speed – translates into value. James explained that the best candidate processes are those that require manual interaction with a computer interface, are largely rules-based, consume a significant amount of time, and are performed at frequent intervals. After evaluating 20 candidates – 7 were finally chosen. Gilead felt that the concept of RPA had already been proven, so decided to conduct a ‘proof of value’ across 7 finance processes that ran reports, reconciled bank statements and others using Blue Prism’s RPA platform. The resulting swift ROI proved compelling – with the company saving over 1600 human working hours – and also generating additional resource capacity for the business. Once RPA’s value was proved at a senior level, the emphasis shifted to engaging with Gilead’s broader business and delivering more project successes. As Gilead operates in a highly regulated sector, it’s also important that RPA remains appropriately rooted. Therefore, a governance framework and robotic operating model center of excellence (CoE) was created to provide a structured and controlled environment for managing demand, delivery and sustainability of robotic process automation projects. This framework provides a structure for how changes are initiated, prioritized, approved, scheduled – and how scoring outcomes are effectively communicated. Also, now under control are the definition, design, development and test of individual processes too. Gilead has just completed an opportunity assessment for its next wave of RPA – evaluating 21 processes and prioritizing nine with processes from Facilities, IT, Treasury and PTP. Additionally, 14 of Gilead’s staff have now been trained in Blue Prism’s technology, with a further 6 by September 2018. To ensure longer-term RPA wins, Anand advocates best practice approaches that involve employing a structured approach to building out the ROM, identifying which part of the organization will support those capabilities, and the ‘crawl-walk-run strategy. He also believes that having a strategy for risk and controls is also key to assess opportunities early in the design life cycle – and ensure there’s adequate compensation for any of the impaired controls. Establish an ROM and don’t over-engineer it – keep it simple. The ROM should be easy to navigate and intuitive for users to comprehend – so it doesn’t restrict going forward. Always allocate budget to train the group of people who are the vanguards of your RPA journey. For more information on our Blue Prism Cafe series please visit www.blueprism.com/resources/webinars.